After the spat between Ford and Microsoft over the Sync infotainment systems, the two have mended the fence somewhat. Ford announced it's using Microsoft HoloLens to design vehicles – or at least it's testing the tech. If you can't tell from the name, HoloLens is a mixed reality device that projects holograms over real life objects. In this case, designers can change the looks of a concept model by placing holographic augmentations over different sections. Ford claims the HoloLens allows designers to work faster than with clay or any other method. For example, examining how side mirror designs affect the driver's view might only take a few minutes, instead of days or weeks. Designers can "try on" different side mirror layouts, virtually seeing how they look on the car. The HoloLens headsets are wireless, so designers can walk and move around without fear of tripping on anything. The holograms it projects on real objects are supposed to be of photo quality and three-dimensional. The headsets can tell what angle a person is viewing any part of the car, displaying the correct view of any holographic design. That means you can literally walk around and see how different front fascia layouts look from dead-on, from the side, etc. Gesture controls make for intuitive navigation through options. The Microsoft HoloLens. Photo courtesy of Ford. Not only does the HoloLens allow Ford designers to try out different elements without molding any clay, it makes for better collaboration. For example, designers in Dearborn, Michigan could be interacting with counterparts in California, England, Brazil, or anywhere else around the globe. They all see the same virtual reality designs at the same time. That means everyone can provide feedback immediately, expediting the process and making for real-time design collaboration. In turn, the designs of future Ford models might have a more international flavor, something that would give the Blue Oval an edge in the marketplace. Speaking of collaboration, the HoloLens has some other features for when designers and engineers are working alone. They can leave virtual "sticky notes" on different parts of a vehicle, commenting on any aspect of the design they wish. If they prefer, users can also record voice notes, creating a guided tour of a design theme. These are things that haven't been a reality, until now. One of the most exciting, and untapped, potentials of the HoloLens involves using it in the engineering development process for vehicles. Exactly how that plays out remains to be seen. 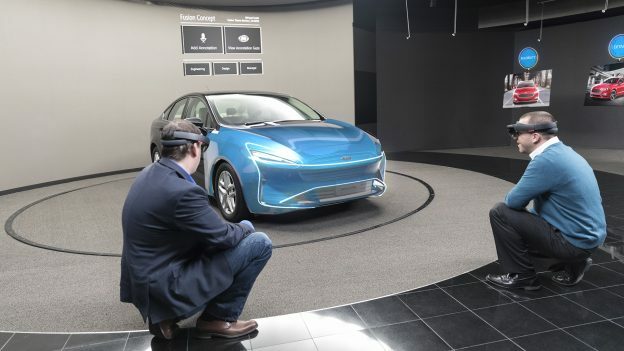 For now, the HoloLens has seen limited action within Ford. Designers and engineers have only been using it for the past year at the headquarters in Dearborn. 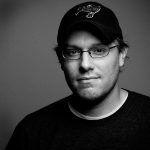 With the positive feedback management has been fielding, the next logical step is to incorporate the technology in other design studios and see what happens. That's exactly what Ford is doing, so it will be telling to see what results we see in the next few years. By the way, the talk of the HoloLens replacing clay models probably isn't accurate. Even Ford admits that the HoloLens has been used to project design elements on clay models. In other words, it would augment, not replace, the tried-and-true design tool. Of course, Ford isn't the only organization using HoloLens. Volvo has toyed around with using the tech in dealership showrooms to demonstrate how vehicle safety features work. The possibilities for this could be endless. If you're interested in HoloLens for your work, know the devices don't come cheap. Microsoft sells the Development Edition for individuals at $3,000 each. The Commercial Suite version, which is geared at organizations, costs $5,000 each. Why do kangaroos drive self-driving cars crazy?